There are other sources of calcium besides milk. 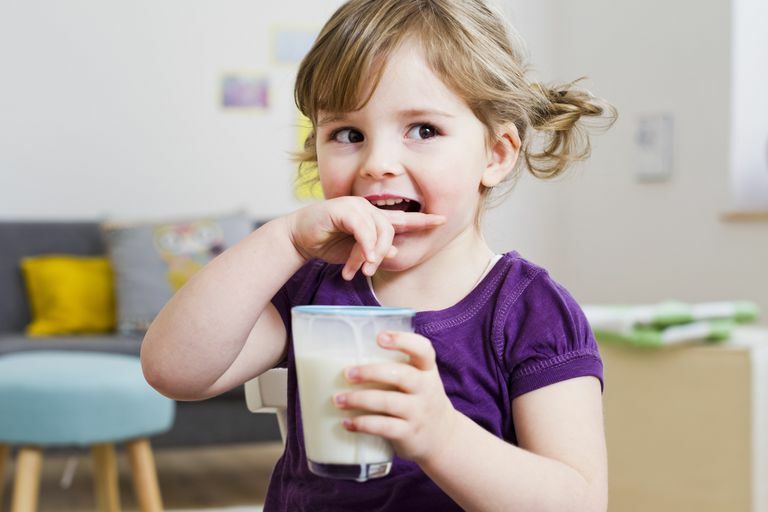 Is it necessary for toddlers to drink milk? While they don't necessarily need milk, and indeed many don't tolerate it very well, young children do need calcium and Vitamin D, which are readily available from milk and dairy products. There are alternatives to milk, though, and other ways to give your child calcium. One alternative is to give your child fortified soy milk. However, keep in mind that soy milk is all low fat, and it isn't recommended to limit a child's fat intake until he is between 2 and 3 years old. So a child drinking soy milk will need to get fat from other foods in his diet. So, based on an average requirement of 16 oz of milk per day, whole milk provides 16 grams of fat, comparaed to the 7 to 10 grams they'd get from soy milk. Giving the extra 6 to 9 grams of fat from other sources should ensure that your child is getting enough fat in his diet. Based on a 1,300 calorie diet and with 30 percent of calories coming from fat, a toddler probably needs about 40 grams of fat each day. Another alternative is to give a toddler soy formula, which is milk free and has all of the fat and calcium that a growing toddler needs. As for other kinds of milk, goat's milk is discouraged for children under age 12 months because it lacks iron, folate and Vitamin B12. But pasteurized and fortified goat's milk can be given to older children. If your child is allergic to or doesn't tolerate cow's milk, then he is likely to have similar problems with goat's milk, as they share many proteins and both have lactose. Other foods that are good sources of calcium include calcium-fortified orange juice, yogurt and cheese. It becomes more difficult if your child has a true milk allergy, since he likely wouldn't be able to tolerate yogurt or cheese. On the other hand, children with a simple lactose intolerance may be able to handle some dairy products. So choose food products that are high in calcium to get your child the calcium he needs, but make sure that they don't interfere with his allergies or food intolerances. And compare food labels to choose brands or types of foods that have a higher percentage of the daily value of calcium. For children who can eat bread and cheese, a grilled cheese sandwich can provide almost a whole day's worth of calcium or 750 mg.
A supplemental vitamin may also be helpful if you don't think your child is getting enough Calcium from his diet. However, vitamins, even those with extra calcium, generally only have about 200mg, or 20 percent of daily requirements, so you usually also need to supplement these vitamins with foods labeled 'High in Calcium'. See our guide to Buying Vitamins for more information. Also, according to the AAP, children who don't drink 500 ml (about 17 ounces) of milk each day and who do not get regular sunlight exposure should get 200 IU of Vitamin D each day. How Can a Toddler Get Enough Nutrients Without Drinking Milk? Is It Possible for a Child to Drink Too Much Milk? When Can My Toddler Have Cheese? What Is the Amount of Grain You Should Be Serving Your Toddler? What Is a Toddler Serving Size of Fruit? Should You Be Concerned About Toddler Obesity?